The UK inquiry into contaminated blood products must establish lessons that improve public safety, campaigners in Scotland have said. Thousands of NHS patients were given blood products from abroad that were infected with hepatitis C and HIV in the 1970s and 80s. Prime Minister Theresa May ordered an inquiry into the scandal on Tuesday. But Haemophilia Scotland said there were still questions about how the UK-wide inquiry would be carried out. The prime minister has said the probe would establish the causes of the "appalling injustice" that took place. It has been described as the worst treatment disaster in the history of the NHS. Bill Wright, of Haemophilia Scotland, told the BBC: "After many years, we very much welcome a UK-wide inquiry. We've waited literally decades for this to happen. "However, there are a lot of details that are yet to be determined, such as how it's going to be conducted, where it's going to be held, what it's going to look at - and when it's going to start and how long it might last." An inquiry into contaminated blood has already been carried out in Scotland, publishing its findings in 2015. The Penrose Inquiry concluded few matters could have been done differently and made only a single recommendation - that anyone in Scotland who had a blood transfusion before 1991 should be tested for Hepatitis C if they have not already done so. There was an angry response to the report from victims and relatives who had gathered at the National Museum in Edinburgh to see its publication after a six-year wait, with shouts of "whitewash" after its conclusions were read out. On Tuesday, the Scottish government said it was "very surprised" that the new inquiry was expected to extend to Scotland. A spokeswoman added: "The UK government did not seek to discuss this with us in advance of their announcement. We will be seeking clarity as a matter of some urgency. "People in England and Wales should get the same opportunity to get answers as we have already given through the Penrose Inquiry in Scotland." 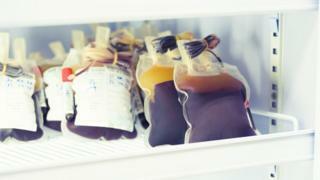 A recent parliamentary report found about 7,500 patients were infected by imported blood products. Many were patients with the inherited bleeding disorder haemophilia. They needed regular treatment with the clotting agent Factor VIII, which is made from donated blood. It could be a public Hillsborough-style inquiry or a judge-led statutory inquiry, the prime minister said.